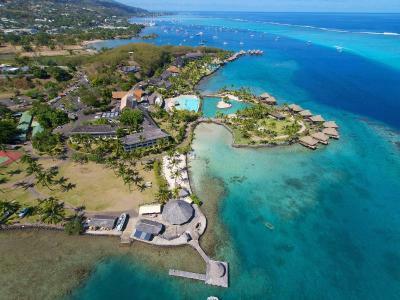 Lock in a great price for InterContinental Tahiti Resort & Spa – rated 8.5 by recent guests! A beautiful hotel in Papa'ete, what's not to like. The breakfast was horrible. I though this was a 5* resort, and usually intercontinental is really good. This was horrible. The food was horrible and over priced. A PIZZA HERE IS 39$ and if you want breakfast, dont go there and get it. Its 45$ in person. Choose the breakfast option online while booking the resort. You save alot of money. Staff was friendly. Beautiful property with nice amenities. Nice landscaping. Dive center staff very friendly. Excellent hotel with fantastic over water bungalows. Staff very friendly and location great for a nice sunset. Awesome resort and the staff are so accommodating. Our flight was cancelled and there was absolutely no issue with staying in our room. Beautiful views and grounds. Close to airport if your on a short stay waiting for your flight home. Very polite and helpful staff, most of which some enough English that there were few communication issues. Beautiful pools and lagoon. Beautiful property and very close to the airport. The food and amenities are very nice and consistent with what one would expect from a larger worldwide resort company. Breakfast buffet was very good. The staff was very friendly. We arrived at 6:00 am and they gave us a phone so they could call us when our room was ready. We were able to relax in comfortable lounge chairs while we waited. Lovely hotel grounds. 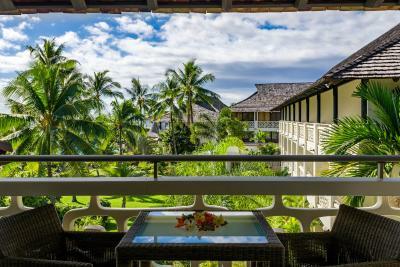 InterContinental Tahiti Resort & Spa This rating is a reflection of how the property compares to the industry standard when it comes to price, facilities and services available. It's based on a self-evaluation by the property. Use this rating to help choose your stay! 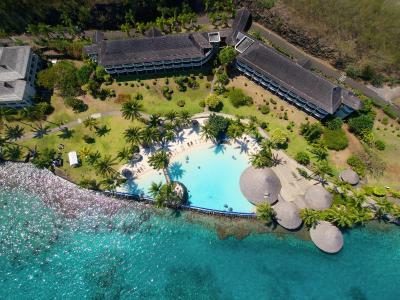 One of our top picks in Faaa.A lavish garden setting, a gorgeous turquoise lagoon and volcanic peaks rising up in the distance, the InterContinental Tahiti Resort & Spa is the perfect launch-point for your French Polynesian vacation. InterContinental Resort Tahiti is less than 5 minutes’ drive from Faaa International Airport. The museums, shops, galleries, market and nightclubs of Papeete city center are a 10-minute drive away. Guests have access to a diving center, open-air aquarium and tennis courts. Deep Nature Spa by Algotherm features a relaxation area with steam bath, and a fitness room with lagoon views. The hotel's overwater restaurant, Le Lotus is located near the sand-bottomed swimming pool and offers beautiful views of Moorea. The menu features gourmet meals and a selection of fine French wines. When would you like to stay at InterContinental Tahiti Resort & Spa? Comfortable room with lagoon views. Comfortable room with tropical grounds views. Comfortable room with garden views. Comfortable room with view of the lagoon. Features panoramic views of the lagoon, reef and ocean. Features a private terrace and platform for direct water access. This bungalow features a cable TV, mini-bar and bathrobe. This twin room has tropical garden views, twin beds, a flat-screen TV, air conditioning and bathrobe. This twin room features air conditioning, bathrobe and mini-bar. This double room has tropical garden views, a bathrobe, air conditioning and cable TV. 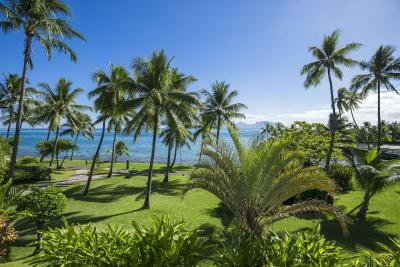 House Rules InterContinental Tahiti Resort & Spa takes special requests – add in the next step! InterContinental Tahiti Resort &amp; Spa accepts these cards and reserves the right to temporarily hold an amount prior to arrival. InterContinental Tahiti Resort & Spa accepts these cards and reserves the right to temporarily hold an amount prior to arrival. Transfers are available to and from Faaa International Airport, for an additional charge. Please inform the hotel in advance if you want to use this service, using the contact details found on the booking confirmation. Taxis are also available at the airport. Getting checked was very difficult since the desk was severely understaffed. Also, many requests for accounting assistance went unanswered, although the final accounting was accurate. The place was very crowded as there are a lot of tourist arriving and leaving every day because of cruse ships and so on. There is often a very noisy show, and no other breakfast place. The first day we had to take breakfast in the lobby, which was unconfortable - but they offered us drink for that. They had an item on the menu, that we tried to order three times, but they never had it. We really liked the lagoon and the fish there. It was interesting to watch them. We liked the fitness and the pools, especially as the weather was not so good, we could not swim in the sea. Dinner was good. The view out of the room was good. When we complained about a problem, we got three drinks on the house. The garden, pools and the whole house looks very nice. Not great for short people. Towels etcway too high..had to stand on the toilet to retrieve. Arrived 1 am and had to walk quite a disttance in poorly lit corridors by myself to locate my room. More english instruction would be appreciated. Strike was ongoing. Only food option was buffet, which was pricey with limited options. Was not informed of strike nor the impact it would have on services (specifically food service) at the resort. Our shower .. Service at the restaurant. One expects, especially given the very high cost of even the least desirable rooms, that this hotel with it's elite brand would be wonderful. The furniture in the rooms, the carpet in the halls, and the lobby and reception areas feel more like 1970 than 2019. As a previous reviewer said, the hotel is "tired and shabby" and from my experience, not up to the standards of other InterContinental Hotels in which I've stayed. I'm surprised that others have given it such high marks. But that's why there's chocolate and vanilla. The view of the lagoon. The rooms are very small with hardly any hanging space for clothes. The 'doona' on the bed is a little over the top for a tropical location. There seemed no alternative when we asked if we could just have a bed-sheet so we could sleep without the air-conditioner going full blast. It got no response. Finally, in a hotel where you are paying over $500 USD a day, it doesn't seem too much to ask for a English-language movie channel on the TV. I know this is a French-speaking country, but surely catering slightly to those clients who only speak English isn't too much to ask. Fantastic location with a view that takes the breath away! The staff were always helpful and courteous. The 'lagoonarium' where you can swim and snorkel with reef fish among the coral reefs is a real treat. All this in the safety of an enclosed pool space. Upgraded to bungalow which was a nice surprise. The complete design of the resort really provides relaxing environment. Great staff service from check-in, porter, restaurant to check out. Special thanks to Mr. Marie Steven who really taking good care of customers feeling!! The Polynesian show during dinner was fantastic and a great surprise, as we didn't know it was going to happen and the show itself was amazing. The staff were very good, especially Day who checked us in & the guys who showed us to our room & collected our luggage. The pool was incredible.